Seriously? OMG! WTF?Candice Bergen Archives - Seriously? OMG! WTF? Is Book Club 2 happening? Book Club was last year’s sleeper hit and yesterday the film’s stars got together. 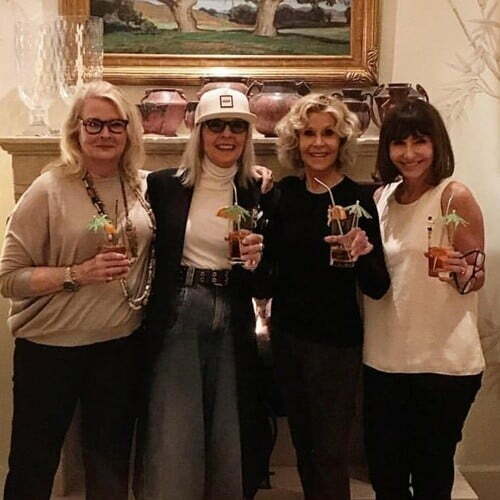 Does that mean that Candice Bergin, Diane Keaton, Jane Fonda and Mary Steenburgen are letting us know that they are working on a sequel? Sadly, nope. It just means that made a friendship that lasted long after they were done filming. Personally, I think they should do a series based on the movie and each week they take on a new book that changes their lives. Imagine if they took on a murder mystery book where four friends vow to kill one of their lovers, but they don’t know which one actually do the crime. Now they are all suspicious of each other after Andy Garcia is injured by mysterious means. I would watch, wouldn’t you? Last week, Brett Kavanaugh, who was accused of sexual assault from his teenage years, was confirmed to be a Supreme Court Justice. People kept saying, “Why come forward 36 years later?” Or they would say, “She has no proof.” I guess they were never sexually assaulted or harassed, so they do not understand what it was like in the old days. Tonight at 9:30p on CBS, Murphy Brown shows us what was like years ago as compared to now and why women did not say anything back then. After the class, Frank (Joe Regalbuto) realizes he might need some help and Pat (Nik Dodani) has an app he created that might help him. If he says something inappropriate, then it buzzes him. Side note, someone needs to make this app real! Anyways, Murphy, Miles and Corky (Faith Ford) go to the bar, and the latter talks about the times she was sexually harassed when she was first starting out. That strikes a nerve with Murphy and causes her to remember something that happened to her when she was younger. Later that day, Avery (Jake McDorman) realizes that something is off with his mom (with a line that will make you LOL), so he asks her what her what is going on. She tells him and he explains to her what happened to her is not her fault. But it is still weighing on her. She goes to the bar and talks to Phyllis (Tyne Daly). The bartender, who does not like give her advice, gives her some. She needs to confront her attacker. That is when she decides to see him and confront him about their past. What happens next is something everyone needs to see. It might show all of these people, who cannot understand the #MeToo movement, why it is so important. Why he said/she said is not just perceived as he said. For the first time in history, she said being heard just as loud if not louder. Tonight, I highly suggest to everyone, to watch Murphy Brown because it is a real eye-opener. It shows us how the women of today feel empowered that what happened in their past is not their fault. They should not be ashamed. That they are victims and not their assaulters. Maybe if this aired last week, Kavanaugh would not be on SCOTUS. Which he should not be but that is a whole other episode. Murphy Brown is having some fun at Donald Trump’s expense! If former Vice President Dan Quayle thought he had really rough from Murphy Brown back in the ’90s, he got off easy as compared to what Donald Trump will likely go through this time around. The revival is still a few weeks away from its debut, but that is not stopping them from taking shots at the president now. Today they released two promos and they really go after him. In one commercial, it is Candice Bergen and Grant Shaud texting and in the other one, it is her with Joe Regalbuto. Both are yuge disses and really funny. Hopefully, the show, that is back on September 27th on CBS, is just as funny as these ads. Soon enough we will know if the truth isn’t the truth. Just one complaint, I hate when people text on camera because it looks so unnatural. FYI Jim Dial will be appear of the Murphy Brown revival! I do not know who is more excited about his return us or Regalbuto. I think we are a close second. Seriously, am I the only person who is happy to see FYI all together again? Hopefully, now that the 82-year-old got a taste of what it is like being back on the show, we will see him more often. The show’s first/eleventh season debuts on September 27th. Murphy Brown returns to CBS on Septmeber 27th after a 20 year hiatus, and yesterday the cast including Candice Bergen, Faith Ford, Grant Shaud, Joe Regalbuto and creator Diane English got together for their first table read on Murphy Brown 2.0 and we are getting our first glimpse at the set. While the FYI stage is different, you can tell that her condo is the same. With a townhome like hers, why would anyone move? Proving we can go home again and I cannot wait to do that in two months.